Kitae(forging pattern) : Kitae is fine Itame (weaved wooden grain) and outstanding Itame-hada appears upper Monouchi area. A mottled mist of Shirake-utsuri that starts from Hamachi is lying over the entire surface like fogged up. Hamon(tempering pattern) : Hamon is Ko-nie a bit on tighter side, starts just above Hamachi point "Yakiotoshi" indication where varies in pattern "Komidare" then Chu-suguha with an indication of Nioi such as node "Fushi"and foot "Ashi" activities. The interior is filled with misty sparkling Nioi where some bright YOU 葉 appears. The entire quench scene shows abundant activity of Nie and Nioi. Boshi (tip): Temper of Boshi is wide Suguha in good manner, medium circle turns back. Nakago(tang) : The Nakago is UBU original. One Mekugi-ana retaining hole. Takanoha V-shaped file marks. The bottom heel is Ha- agari Kuriji Uneven U-shaped in full. The signature is located on upper the Shinogi-ji in front, chiselled as a bit on thinner side, sharp-edged long character that starts from the place of work Noushu-Seki-ju 濃州関住 then a name of smith KANEFUSA-saku 兼房作. During the medieval Muromachi period, several generations of sword masters named KANEFUSA lived in Seki town had been the most famous and played one of the most major roles of sword production. He was wide in the idiom such as "Kenbo Midare" (slender waist, round head clove shape) also "Sanbon-sugi" (triple aligned Sharpened head) and "Suguha" that originated in Yamashiro tradition like this example. From the encyclopedia [Nihonto Meikan], the founder KANEFUSA was active in Eikyo era (1429-) as a son of KANESHIGE 兼重 but the earliest specific date of year is Bunmei 1 (1469) who is judged as a practical 1 st generation. KANEFUSA with date of year Bunmei 12 (1480) and 14 (1482) is provisional 2 nd generation and KANEFUSA with Iwami-no-kami 石見守 title of Daiei 7 (1527) is supposed to be 3 rd gen. The later generations in Koto period are Eiroku-Genki era (1558-72) as the 4 th.and the 5 th generation of KANEFUSA would be active during Genki-Tensho era (1558-91). 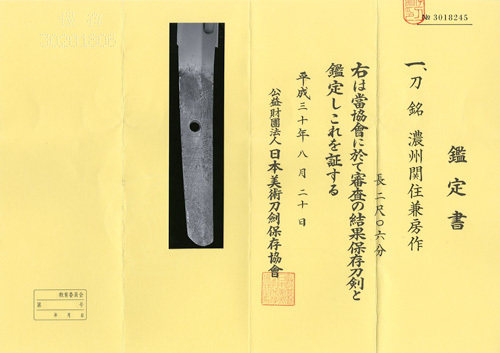 Those KANEFUSAs of end Muromachi period are very good at quenching of Kenbo Midare and had a great influences on the other sword makers in Seki town. Noble sword smith Wakasa-no-kami UJIFUSA 若狭守氏房 was born in the 3 rd year of Tenbun (1534) as the 3 rd son of the 3 rd gen. Iwami-no-kami KANEFUSA 石見守兼房 in Gifu. He won the praise from the daimyo Oda Nobunaga to exclusively belong to him. The subject stirring Uchi-katana is a sublime work by the 4 th generation KANEFUSA 兼房. There still remains wide Mihaba in full as well as upper area of Fukura is swelling out. For the history of almost 500 years, it's remains magnificent shape and shows rich activities of Ko-Nie and Nioi.